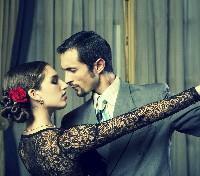 Explore Buenos Aires with a private guide and take in a tango show over dinner. 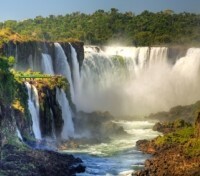 Stand amazed before Iguazú Falls, one of the world’s most beautiful waterfalls. 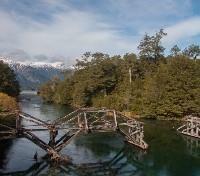 Take in the scenic splendor of the Andean lakes in Bariloche. 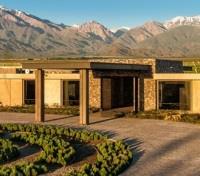 Sip some of Mendoza’s best wines on a private tasting tour of high-altitude wineries. 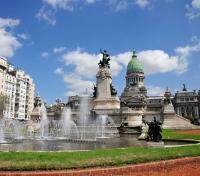 Allow Park Hyatt Buenos Aires to introduce you to one of the world's most stylish and cosmopolitan cities. 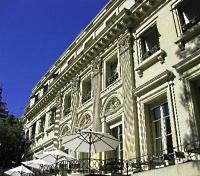 Perfectly located on Avenida Alvear, in the heart of the French heritage district of Recoleta, Palacio Duhau, this 5-star luxury hotel is a short stroll to MALBA (The Latin American Art Museum of Buenos Aires) and Puerto Madero. This visually arresting landmark holds its own in the eclectic Buenos Aires skyline by blending the 1930’s charm of the French Palace Duhau with contemporary design and décor. Here, belle-époque elegance meets tech-savvy modernity and comfort, marvellously enhanced by renowned Park Hyatt luxury service. 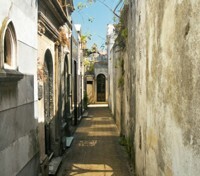 Situated in a residential neighbourhood surrounded by luxury boutiques, savour a unique and relaxing travel experience in the beautiful gardens or private Art Gallery. 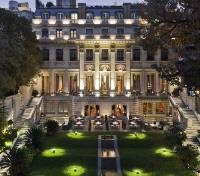 The Park Hyatt Buenos Aires hotel is also home the Ahín Wellness & Spa for rejuvenating spa & massage treatments. 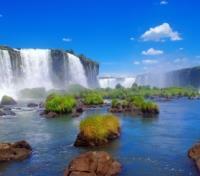 Relax on your direct flight from Buenos Aires to Iguazu Falls. The flight is approximately one hour and 45 minutes. Please note: Flight rates and availability are subject to change until booking and are a separate purchase. 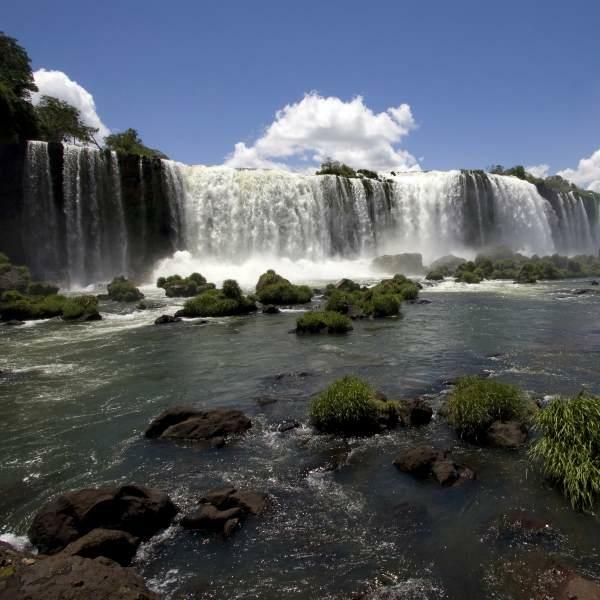 Board a flight in Iguazu Falls with service to Bariloche, connecting via Buenos Aires. Approximate flight duration is six hours and 30 minutes. An English-speaking representative will meet you and direct to your awaiting vehicle. 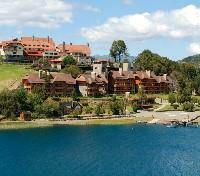 This transfer service is for transfers to or from hotels outside of Bariloche. For guests arriving in the region, your assistant will help with your hotel check-in. During departure, your assistant will help with your airport check-in. Surrounded by the Cerro Lopez and Tronador mountain peaks and the Moreno and Nahuel Huapi lakes, the Llao-Llao Hotel & Resort Golf & Spa has a 15-hectare park, including the 18-hole golf course, the marina, beach, solarium, heated indoor and outdoor vanishing edge swimming-pools, Spa and Healthclub with sauna, Fitness Center and other leisure activities. Llao Llao has five restaurants. Guests can enjoy a wide variety of dishes, from International Cuisine to top level traditional food, such as the popular "Llao Llao Tea" which is served overlooking the spectacular view of the Hotel gardens and the breathtaking Nahuel Huapi Lake. The private guided tour to Cathedral Mountain starts from your hotel and passes Playa Bonita, traveling 11 km ahead and arriving at the Cathedral's base. Cathedral Mountain received its name from the granite spires that resemble a gothic cathedral. It is considered one of the most important ski resorts in Argentina, offering many facilities for ski enthusiasts (during the appropriate season). From the base, a chair-lift or a cable-car ride (additional cost) can be taken which allows travellers to admire the beautiful view and (depending on the season) enjoy the snow or Lake Forest atop the mountain. Heading back down the mountain you will return back to Bariloche. 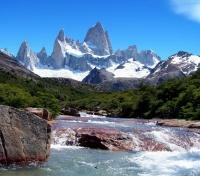 Enjoy a full day private tour to San Martin de los Andes. Take in the stunning scenery as you make your way along the winding road out of Bariloche, with natural beauty that will surround you. After driving past the Manzano Port you'll soon arrive at Villa La Angostura. Once you leave the village behind, you will find yourself on the magnificently scenic Seven Lakes Road: these are Correntoso, Espejo, Villarino, Falkner, Hermoso, Machónico, and Meliquina. The scenery of all this area is made up of the Andean Patagonian forest, formed by various notofagus species, such as lengas, coihues, radales, cypresses, raulies, ñires and robles pellín. The area is beautiful no matter what the season - during the fall, the surrounding scenery teems with red, ocher and orange shades; in the winter, it dresses in white; in the spring, it is flooded with bright colors; whereas in the summer, the intense green of the forest invades the sight and is even reflected on the lakes. Enjoy stops along the way to fully appreciate the views, before arriving into San Martín de los Andes on the shores of Lácar Lake. 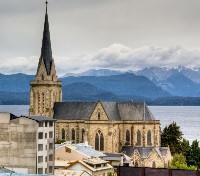 At days end, you will be brought back to your hotel in Bariloche. 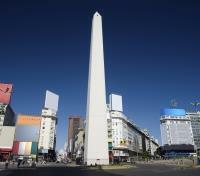 Board a flight in Bariloche with service to Mendoza, connecting through Buenos Aires. Approximate flight duration is five hours and 20 minutes. Enjoy a private airport transfer alongside an English-speaking guide, with a private vehicle and driver. This evening, enjoy dinner (not included) at Siete Fuegos. 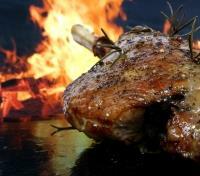 Meaning “Seven Fires,” it describes Francis Mallmann’s honed collection of open-flame cooking techniques, inspired by Argentine gauchos and European immigrants, and refined over hundreds of years. Savor the rustic, fiery flavors of specialties including nine-hour slow-grilled rib eye, cast-iron baked salt-encrusted salmon, grilled seasonal fruits, and more, paired with award-winning boutique wines. The hotel also offers fabulous options for kosher guests, as well as vegetarians and vegans. Dine indoors or out, or enjoy a front row seat in the open kitchen where you can watch these artisans of fire create impassioned Argentine fare. Reservations will be required well in advance, and your meal is not included. 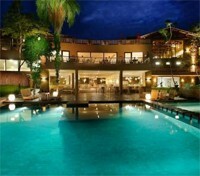 Typically, three-course meals (drinks excluded) cost approximately $100 USD per person. 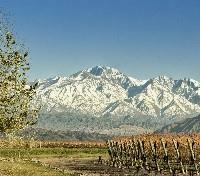 The Vines of Mendoza is more than an extraordinary place. It defines a lifestyle. 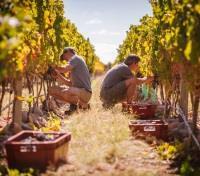 Rooted in the pleasures of making, drinking and sharing wine, the Vines immerses you in the delights of Argentine culture, rustic natural beauty and warm-hearted hospitality. 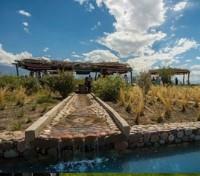 Set on more than 1,500 acres of pristine private vineyards, it is located within Mendoza’s renowned winemaking region, one and a half hours from downtown Mendoza. 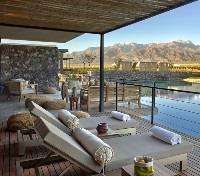 The resort’s surrounding landscape includes luscious vineyards, fresh vegetable gardens, winding pedestrian-only paths through the vineyards, a bocce ball court, winery and tasting room—and breathtaking views of the Andes Mountains at every turn. Apart from a daily, complimentary breakfast, you can enjoy pool(s), a spa & fitness centre, as well as outdoor activities and excursions that will invigorate, relax, restore and replenish your body, mind and spirit. 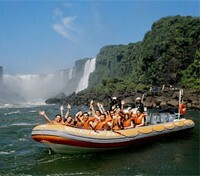 Today is at leisure, so choose from one of the many activities available at your hotel, the choice is yours! Optional activities offered include: climbing wall and running trails, infinity pool with private cabanas and hot tub, bocce ball court, spa and fitness center, winery and winemaking activities, fire pits, biking through the vineyards, horseback riding, tango lessons, cooking classes. Domestic flight from Mendoza to Buenos Aires. The flight duration is approximately 2 hour. Flights are subject to change based on availability and are a separate purchase.